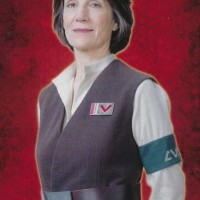 Major Kalonia was a human female who served as a doctor with the Resistance. She was stationed on the Resistance base on D’Qar thirty years after the Battle of Endor. Medium-weight fabric, off-white color long-sleeved shirt with stand-up collar. Worn open at the top with no visible fastenings. Tunic style vest, brown or dark olive colored medium-weight fabric. Folds over to the right with no visible fastening. Medium-weight fabric plain black pants with no ornamentation. 2″ dark brown leather belt with plain, rectangular buckle of dark silver or pewter color. Black boots that go up almost to the knee with rounded toes, straps with buckles at top and at ankle. Flat soled or very low heeled (1 inch maximum heel, no spike heels). Medium length naturally colored hair. Screen accurate badge of a Resistance officer, rank of Major. Dark blue fabric, 4″ wide, with 2″ high Aurebesh lettering in white on band that translates to MEDIC. Worn on upper left arm.